When Consumers Revolt Against Traditional Marketing, What Should You Do? When little-known, first-term Illinois senator Barack Obama faced Hillary Clinton in the 2008 Democratic presidential campaign, he knew he couldn’t compete with her financially. He couldn’t afford telemarketing and direct mail campaigns or TV and radio advertising. So instead of playing by the old rules, he made new rules. He started blogging and he created profiles on Facebook, Twitter, LinkedIn and YouTube. He also hired the co-founder of Facebook, Chris Hughes, to be his Internet strategist. And he won the Democratic presidential nomination even though he spent a lot less money than his opponent. At the time of the election, Obama had five million fans on Facebook—over four million more than Clinton. On MySpace, the numbers were approximately 800,000 and 200,000, respectively. On Twitter, he had over 100,000 followers and his opponent had about 5,000. And he did all of that by following the principles of inbound marketing. If you still market your business the old-fashioned way, you’re using outbound marketing techniques. Outbound marketing is throwing your message into the public arena and hoping the “right people” see it. Inbound marketing is creating a message that only the right people would be interested in, and then helping them stumble upon it. Outbound marketing—You spend hundreds of thousands of dollars to advertise the 2012 Lexus LFA during the Super Bowl. Only a tiny fraction of that audience would qualify financially. Inbound marketing—You help people who have the income and the desire for the 2012 Lexus LFA to find your website, your blog and your YouTube channel. I think I’m not the only one who’s fed up with traditional marketing techniques. Many people have turned their collective backs on traditional advertising and ask their friends and family members for advice instead. They know any ad they see is just a sales pitch. And they probably don’t need whatever is being advertised. But when they do need a product or service, they know their friends and families can give them unbiased testimonials about the products and services they like. And tapping into those conversations is one of the new rules of marketing. So if spam-blockers, TiVo and mute buttons have convinced you to reconsider expensive outbound marketing techniques, have I got a book for you! 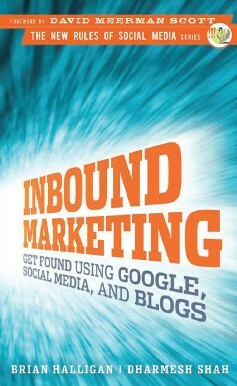 It’s Inbound Marketing: Get Found Using Google, Social Media, and Blogs by Brian Halligan and Dharmesh Shah. Getting found doesn’t mean spending hundreds of thousands of dollars to create a prime-time commercial that most viewers will mute. Or putting an online banner ad for an arthritis drug in front of a 21-year-old woman. If this sounds like a lot of work, it is! Did you think inbound marketing would be easy? Did you think all you had to do was set up a Google Alert to monitor mentions of your company name? This book contains many tips for startups too. If you’re starting a business, you have one major advantage over established businesses when it comes to inbound marketing—you won’t have to “unlearn” anything! In fact, you can think of inbound marketing as the “Five C’s”: you’re Converting Creativity, Content, and Conversation into valuable Customers. So take a tip from Barack Obama. Pick up a copy of Inbound Marketing, cut your marketing bill in half and start a conversation with your customers. They’re waiting to hear from you.